Intégralement restaurée dans nos ateliers il y a 1 ans. 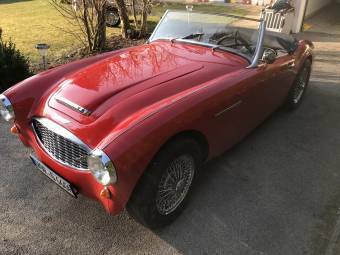 Healey fahren in seiner schönsten Farb Kombination ! 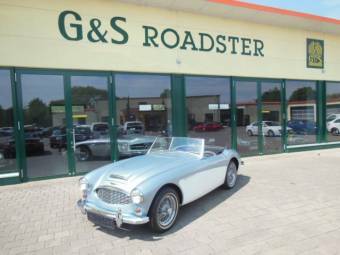 Wer sucht sehr schöne Austin-Healey-Rarität? 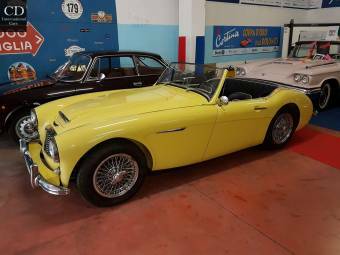 Austin Healey 3000- LHD, H-Kennzeichen. 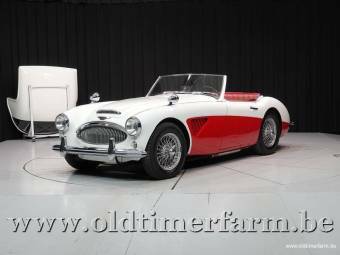 The Austin-Healey 3000 was a highly successful British sports car, created by Donald Healey, which served as a replacement for the previous Austin-Healey 100-6 model. 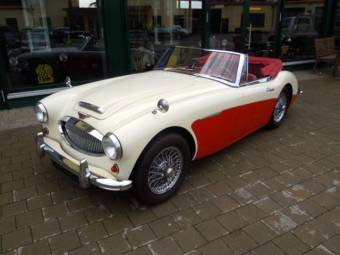 The best-known and most popular of the so-called 'Big Healey' cars, it was originally introduced in 1959 and production continued up until 1967. 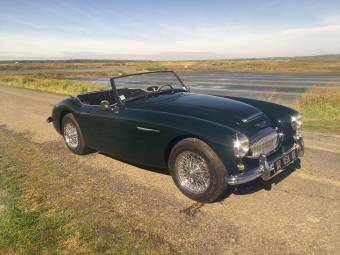 Assembled at the British Motor Corporation's Abingdon works, the vehicle's bodywork was made by Jensen Motors. 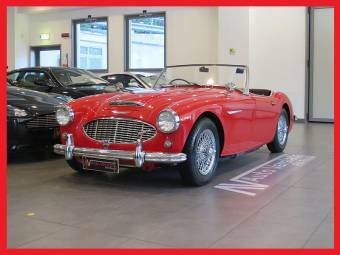 Throughout its life cycle, the Austin-Healey 3000 enjoyed great success in competitive racing competitions and emerged as a firm favourite with car collectors around the globe. 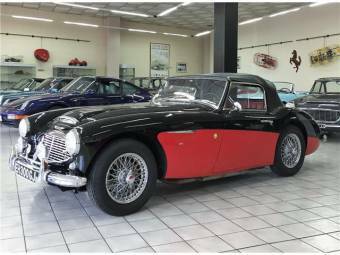 The original Austin-Healey 3000, introduced in 1959 and retrospectively named the 'Mark I', only contained minor changes from the 100 and the 100-6 models. The engine capacity was increased from 2.6 to 2.9 litres and the disc brakes were changed, but the 100-6's wheelbase and body remained. 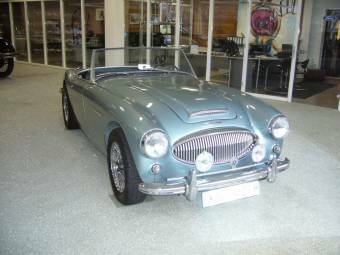 A two-seater and a 2+2 model were available and a total of 13,650 'Mark I's were produced between March 1959 and March 1961. In terms of performance, the 'Mark I' 3000 was able to reach a top speed of 115 mph and could accelerate from 0 to 60 mph in 11.7 seconds. 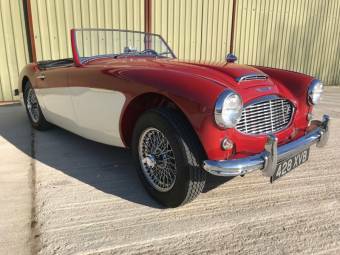 This was improved with the introduction of the Austin-Healey 3000 'Mark II', which was originally released in 1961 and became a convertible in 1962. Along with an improved camshaft and various cosmetic improvements, it was capable of accelerating from from 0 to 60 mph in just 10.9 seconds. Finally, in 1963, the 'Mark III' was released, bringing further improvements in terms of performance and design. 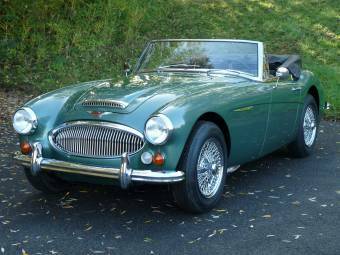 The 2+2 'Mark III' was the most powerful version of the Austin-Healey 3000, with 148 bhp and a top speed of around 120 mph. 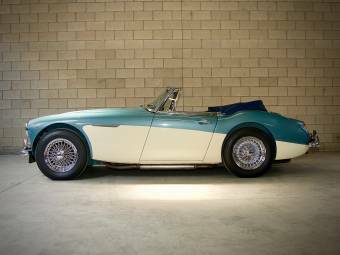 In 1964, a second phase version of the 'Mark III' began production, allowing for more suspension travel and sporting a modified rear-axle location. 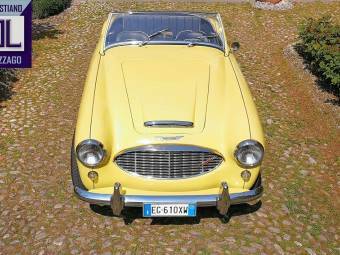 Altogether, 17,712 'Mark III's were created before production ceased in 1967. 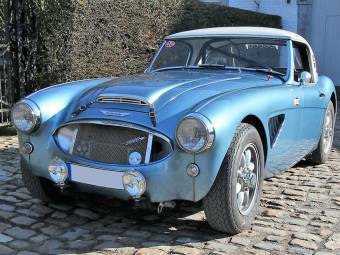 The Austin-Healey 3000 was raced in rally events by the British Motor Corporation's competition department from its introduction up until the mid 1960s, although development of these cars was effectively ended by the success of the Mini Cooper 'S'. 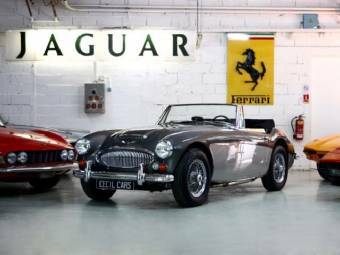 Nonetheless, the 3000 also enjoyed success in various other racing competitions around the world and made appearances at Le Mans, Mount Panorama, Sebring and just about every other major racing circuit.